Swimming pools are built to last. Properly cared for and maintained, most in-ground swimming pools can last as long as the home itself. But the interior surface of the pool won’t last forever. Eventually, after years of use, it may need to be resurfaced. So how can you tell if your backyard swimming pool needs to be resurfaced? Here are a few things to look for. Perhaps the biggest indicator that pool resurfacing is in your short-term future is if your pool is leaking water. But if the pool is built into the ground, how can you tell if it has a leak? If you are putting significantly more water into your pool than you normally do, it’s usually a sign that a leak has developed somewhere on your pool’s surface. You may also notice unexpected pooling on the deck, soggy areas of your lawn that weren’t there before, or crumbling concrete on or near your pool’s walls. Other signs that your pool may need resurfacing are cracks and stains that form on the pool’s walls or floor. Most of the time, stains are superficial and can be easily cleaned or repaired. But when stains grow in size, color, intensity, or quantity, it may mean there is something more going on — especially if they can’t be easily removed. 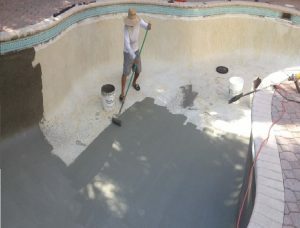 Another indicator that your pool may need resurfacing is when the texture of its walls or floors become rougher and harsher than normal. This often means that the protective coating is beginning to wear away, exposing the raw concrete underneath. Over time, your pool’s chemicals and use can erode the surface of your pool. When you need pool resurfacing, the solution is simple: Call the professionals at Eagle Pools. Our highly skilled, experienced pool resurfacing technicians can get your pool looking better than brand new.